Two days one night, incredible experience over Pergasingan Hill near Sembalun Village and end in the waterfall Sajang village east Lombok. Arrival day : Pick You up at your arrival in Lombok Island, then transfer to Sembalun drive 2-3 hours by private car. Check in Hotel in Sembalun, then meet your guide to get briefing about your trip and walk to Sembalun Village to see Weaver making hand weaving and climb Selong Hill for warming up then back to Hotel and time for your own leisure. Day 1. We welcome you to join our two–day stroll through the rice fields, to talk with the ranchers and delight in the landscape from the high slope called Pergasingan. The perspective from 637 m over the towns and fields of Sembalun Lawang and Sembalun Bumbung is of the superb display of the old caldera of Mt. Rinjani. The project for the walk incorporates; a clarification of the neighborhood tree species that develop at different elevations and how these are utilized by the nearby individuals for customary solutions, likewise how we can aid the neighborhood preservation gather by planting a few trees and types of orchids. We visit the area where, as indicated by legend, it was utilized by the lord to play diversions of turning tops. Your aide and watchmen will demonstrate to us generally accepted methods to play the turning top. The overnight camp territory is called Urat Batua where quite a while prior the villagers used to supplicate before beginning to chase wild deer. A profound pioneer will supplicate and offer endowments to all the parts of the gathering before the watchmen and aide introduce the tents. 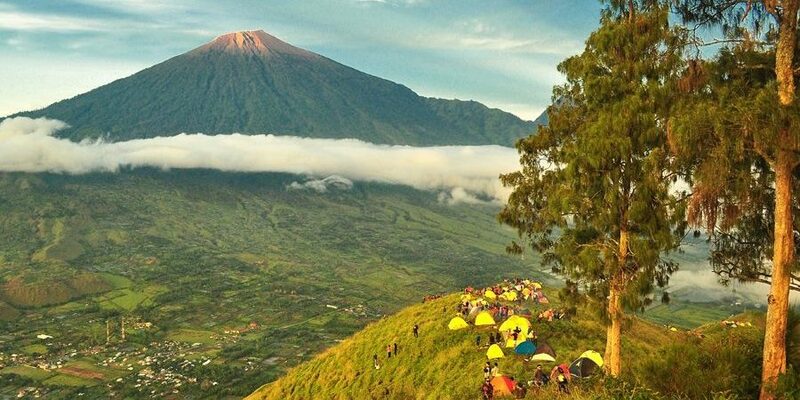 This is an extraordinary spot to watch the nightfall and day break likewise see the summit inclines of Mt Rinjani and inaccessible heap of Agung on Bali. After dim we see the lights of Sembelia town and the far off port town of Labuhan Lombok. After supper we are entertained by our aide or doormen playing a resonant woodwind other than appreciating the ethereal tropical night sky from around 1,773 m above ocean level. Day 2. After breakfast trek down through the downpour woodland to Karya sub-town, the town of Sajang for around 3 hours then see seven wells (Sumur Tujuh), go into the woods again to notice the Black Monkey (Ebony Leaf Monkey) other than heard the uproarious of a mixed bag of winged creatures furthermore different vegetation incorporates the plant for pharmaceutical for neighborhood individuals. Lunch in the backwoods and after that the walk proceeds for around 1.5 hours to the waterfall where, as indicated by legend, the lord used to bathe his stallions. There will be time to investigate and appreciate the stay at the waterfall. On the route back stroll through the group’s arrangement, the aide will clarify their traditions and customs of town life and how they help their day by day work by developing espresso, chocolate and vanilla and, contingent upon the season, you will have the chance to work along them. At that point a simple stroll to investigate the foothills of the well of lava, (Gunung) Mount Rinjani where the group have their fields that are still cultivated generally as their precursors did. Camping equipment ( tent, sleeping bag, matrass, toilet tent ). 3 meals a day during the trekking day. Transport pick up and return. Accommodation 1 night before the trek in Sembalun.